1) Wash the okras put them aside till they get completely dry (or u can pat-dry them with a kitchen towel. Cut the head and tail of ladyfingers and chop them in to ½ or 1 inch slices. 2) Heat oil in a pan and fry half of the onions till they get translucent. 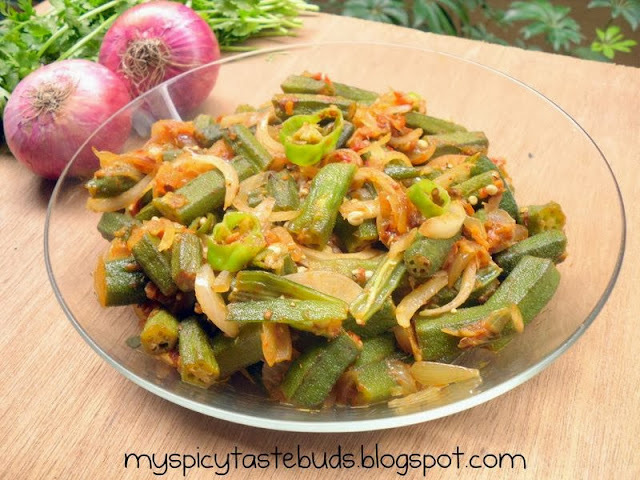 5) once the masala is done and oil separates add in the chopped okras fry for two minutes, cover the pan and let it cook on low medium flame. 6) In a frying pan dry roast the cumins seeds and coriander seeds and then grind/crush them coarsely. 7) After about 5-7 minutes take the lid off the pan, add the remaining sliced onions along with chopped green chilies and sprinkle over the crushed cumin &coriander seeds along with amchoor powder, stir every thing nicely with light hand, cover the pan and again let it cook on low flame for 4-5 minutes. Turn the flame off. Bhindi is ready to be served.